o This mode indicates the total distance travelled since the last tripmeter reset. Total distance is also reset to zero if the battery is disconnected. o Pressing the trip computer switch for more than 1 second, when the tripmeter is being displayed, clears the tripmeter to zero. o The meter's working range is from 0.0 to 999.9 miles. o You can choose the TRIP A or TRIP B.
o This mode indicates the estimated distance to empty from the current fuel in the fuel tank and distance to empty symbol. o When refueling with more than 1.6 gallons (6 liters), the trip computer will recognize refueling. o For an accurate distance to empty, drive more than 30 miles. o When the distance to empty is less than 30 miles, the symbol will flash and the distance to empty digits will indicate "---" until more fuel is added. o For an accurate calculation, drive more than 30 miles. o The meter's working range is from 0.1 to 199.9 MPG. o This mode indicates the average speed since the last tripmeter reset. 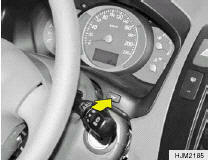 o Even if the vehicle is not in motion, the average speed keeps going while the engine is running. o The meter’s working range is from 0 to 999 MPH. o Press the trip computer switch for more than 1 seconds, when the average speed is being displayed, clears the average speed to "---". o This mode indicates the drive time since the last tripmeter reset. o Even if the vehicle is not in motion, the drive time keeps going while the engine is running. o The meter’s working range is from 0:00 to 99:59.
o Press the trip computer switch for more than 1 second, when the drive time is being displayed, clears the drive time to zero.